I've had less than four months off in eight years, ... 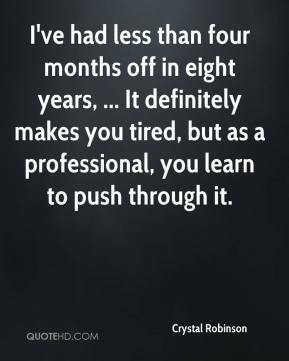 It definitely makes you tired, but as a professional, you learn to push through it. The Fever are a good team. We are a good team. It should be an intense, good playoff series. I think we're getting better every day. We had a group that was together for a long time. Everyone knew everyone so well. I think we're learning what everybody can do. 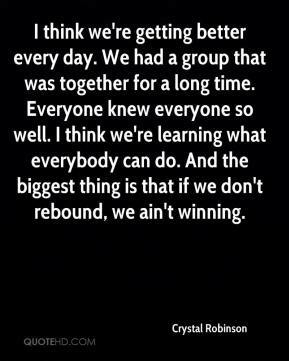 And the biggest thing is that if we don't rebound, we ain't winning. Those girls knew right from wrong. What he did was wrong, but they made the decision to sleep with him.